De Icom IC-R30 is de opvolger van de populaire IC-R20 breedband ontvanger. De Icom IC-R30 ontvangt zowel analoog als digitaal (D-Star, P25, NXDN en dPMR). The RS-R30I and IC-R30 firmware Ver 1.10 will be released in September 2018. The RS-R30A will be released in October 2018. Dualwatch Operation Dualwatch screen The radio can receive on different bands and different modes. For example, HF and UHF signals can be monitored simultaneously. You can scan for other active channels on the B band, while receiving the main signal on the A band. Information screen of received voice Information screen of received voice. 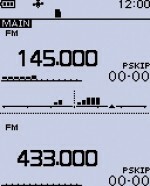 Menu screen Menu screenA 2.3 inch large, dot-matrix display is used in the IC-R30. Screens with large amounts of information are clearly and logically arranged. The four direction keypad provides straight-forward operation of all functions. 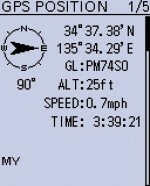 GPS position screen GPS position screenThe integrated GPS receiver displays your current position data, course, speed and altitude on the display. 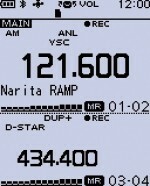 GPS data can also be saved in recorded audio files. The IC-R30 can list up up to 50 stations within 160 km; 99.4 ml from your current location*. Band scope screen Band scope screenThe band scope function enables you to visually search a specified frequency range around the received signaland see the relative received signal strength level. You can jump to the desired signal on the band scope to set the radio to that frequency. * carry out data transfer (including loading Memory channels) and CI-V remote control. You can use a microSD card* for data storage. 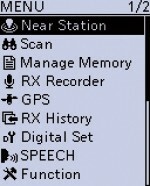 Recording/playback of received audio, RX history log, radio set tings and GPS logger data can all be loaded onto the microSD card.